March 18, 2014 /0 Comments/in Toenail Fungus /by Jenn F.
“I had Aetna tell me they wouldn’t pay for an anti-fungal prescription for my toenail fungus,” writes a reader of Truthout Magazine. The writer goes on to say that multiple appeals and biopsy results didn’t sway the insurance company to pay for an expensive medication, but they did concede that they would pay to have all the patient’s toenails surgically removed! Absurd stories like this are more common than you’d think because health insurers largely consider toenail fungus to be a “cosmetic” issue. We strongly disagree! Makers of toenail fungus medication are charging a fortune for their pills, but efficiency is questionable. 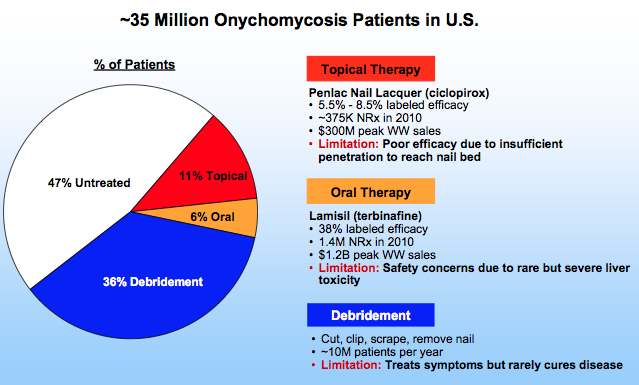 October 11, 2013 /1 Comment/in Toenail Fungus Treatments /by Jenn F.
Do you dream of healthy-looking nails? Tired of breaking, chewing, or hiding them? You’re wise to be concerned about the health of your nails, as they are a portal into the rest of the body. Unhealthy nails could mean you are suffering from some other malady. For instance, yellowed, crumbling nails are indicative of a fungal infection. People with diabetes or prior infections should always be vigilant about their nail health. The American Academy of Dermatology offers their insights for better-looking nails.